The IntelliSpense Syringe Barrel Stand can hold a variety of barrels and prevent obstruction and leakage of dispensing tips or needles in the built-in cup. Keep your bench top clean and free of drips or accidental discharge during assembly operations. When you are working with materials that tend to drip, this stand can be invaluable. Just as most of our lntelliSpense products are created, ergonomic lab and industrial applications always have priority on the list of products we build for dispensing. 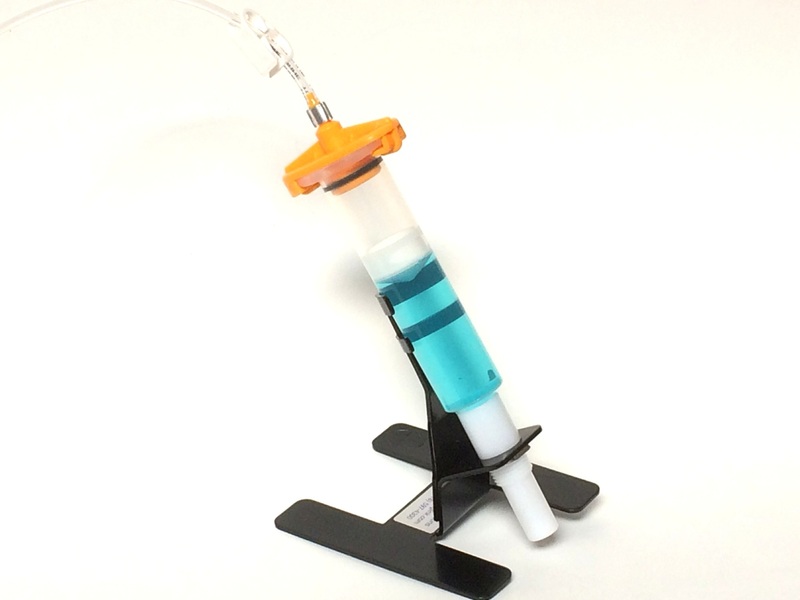 The Syringe stand can be used with any syringe and is built on a wide base with constructed to keep syringes in the upright position. Order the necessary adapter heads, syringes, needles and tips separately. We also carry dispensers for drum or pail dispensing and cartridge dispensers range from manual to semi-automated workstations.